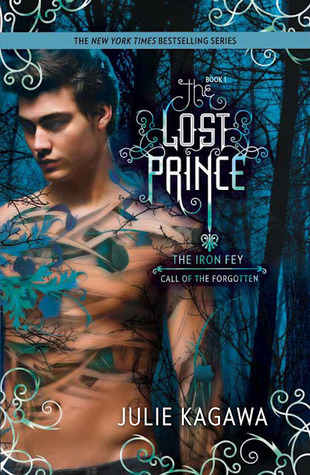 The Lost Prince is the fifth book in the Iron Fey world and is told from a new narrator. You'd think that the series would feel tired, but Julie - amazing writer that she is - inevitably finds a way to make the world of Fey fresh and exciting. Over a decade has passed since Meghan Chase rescued Ethan from the Never Never and eventually became the Iron Queen. Ethan is no longer the cute, innocent little boy who we met in The Iron King. He's now a teenager with a chip on his shoulder. He resents being abandoned by his sister, hates having the Sight (being able to see fey), and hates how the fey ruin his chance at a normal, safe life as soon as they realize he can see them. It's not always pleasant reading a book from an angry person's point of view, but Ethan was a joy. Maybe because he wasn't as annoying as Meghan was at the beginning of the series. Maybe because of his dark humor. Maybe because his inner nice guy kept sneaking out from under his hard exterior. As much as Ethan tries to avoid it, he gets sucked into the Never Never when it's discovered that something is destroying exiled fey and half-breeds. Something had to pull him back into the faery world - otherwise we wouldn't have a book. We're introduced to a few new side characters in The Lost Prince. My favorite is Kenzie, a regular human who gets dragged into Faery with Ethan. She is eternally optimistic, but manages not to seem naive. She's the type of person who sets her mind upon the impossible and gets it done come hell or highwater. She keeps some of Ethan's gloom from falling on the reader and pushes him not only to get further involved with the fey but to also realize that his Sight is not the curse he believes it to be. Kenzie is a stubborn, strong character who is definitely worthy of Ethan. Best of all, my favorite characters are back. Meghan, Ash, and even Puck play side roles in the book. Oftentimes, the idea of them is more prominent than the characters themselves. But of course, Grimalkin is a key character. It wouldn't be an Iron Fey book without Grim. I loved getting to know Kierran, Meghan and Ash's son, who we sort of had a glimpse of in Iron Knight. He's a cross between his mother and father. I highly recommend The Lost Prince. I wouldn't read it unless you've read the other Iron Fey books, although it is a separate story. Once again, Julia has taken us to the world of the Fey - a world that we simultaneously love and fear - and introduced us to characters we can root for. I absolutely adore this book! I found Ethan pretty awesome even though he was so angry all the time... I cannot wait for the next book in this series of epic! I loved this book, too! Ethan has SUCH a chip on his shoulder -- I get some of it but wanted to shake him other times. Kenzie's awesome (I gasped at her "reveal") and I really liked Kierran (he's got to get his own story, don't you think?)! Unfortunately I wasn't a huge fan of this book (guess it's because nothing can really beat my love of the Iron Fey series) but I did quite enjoy getting to know all of the new characters and Kierran of course who was really interesting. Kind of hope he gets his own story someday. Anyway, great review! Love the action as well, and loved Kenzi. Wasn't Ethan great?.?. I can't wait for the next book, I need more Kenji. :D Great review. I'll admit I had my doubts about this one at first. Mostly I was afraid I wouldn't be able to separate it from the original series, but Ethan was a strong enough character to help me with that and I ended up loving this even more. I am so excited to read this one! I have it on my shelf and just haven't had time to get to it, and then I had Julie's Immortal Rules tearing my attention away. I need to go back to it. Glad to hear you enjoyed it so much! I'm eager to meet Kenzie and hearing Ethan's perspective. Amazing review! Geez, I bought this one when it first came out and STILL haven't read it! Total fail on my part! I have heard some mixed things but your review got me all excited again. I'm glad that it was a great read! I struck out with the author's vampire series but I'm hoping I'll have better luck with her fey one. Glad to see your rating staying strong considering it's the 5th book in the series. YAY Alison! I was so excited read this book and of course to see this from his point of view. I love this author and can not wait to read the next book. Nice review! So I haven't read this series yet (I know, shame on me), but it's always nice to hear when a companion series gets a good review because I think it definitely speaks well of the author's talent, like you said. I'll have to get to this sometime! I've heard really good things about the Iron Fey series (and the covers are sooo pretty) but I haven't read the books yet. Sometimes I get real uncomfortable with books about the fey though. I should give this series a try anyway. Thanks for the review!